Am I the last mother on Earth not to adopt Elf on the Shelf as a holiday season behavioral management tool? I think I may be. I don’t actually own an Elf on the Shelf, so I am no expert, but the whole idea seems a little bit creepy to me. A doll that watches your every move, reports everything back to Santa, and can’t be touched by humans? Am I missing something? The psychologist (and Scrooge) in me says: This is not a good thing. Not only is the idea of a little elf running around the house, and then flying up to the North Pole and back scary for kids (and adults, eek! ), but lying to our kids and coercing them into good behavior with the threat of being exposed to Santa? – this can’t be a psychologically healthy parenting tool! And don’t even get me started on Santa himself: what are we telling our kids anyway? Stay away from strangers all year, except this large guy whose face is obscured by all manner of facial hair. And kids, don’t just talk to him, sit on his lap and whisper in his ear about all the material things you want but probably can’t afford and certainly don’t need. Blech. The parent in me says: This sounds like a lot of work. So on top of everything else this month I have to remember to move this little guy around…or else? After asking my kids their thoughts, #1 says she thought it would be creepy, too. She even wondered aloud how scary it would be to have something roaming around in the house while we were all asleep. Child #2 says we NNEEEEEEDD an Elf on the Shelf because everyone else has one, and she would probably have perfect behavior if we had one too. Doubtful. Child #3 had no comment. So, EOTS-practicing parents, what are your thoughts? What am I missing? Help me understand why this little guy has become a December staple! Better yet, send me your best EOTS pictures and I will post them here. 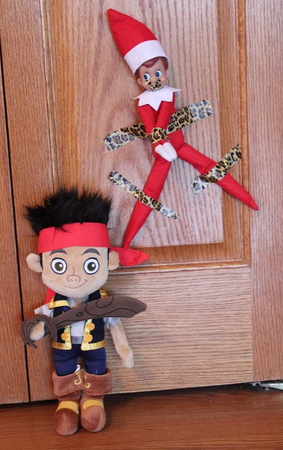 PICTURES OF ELF ON THE SHELF IN ACTION! THANKS FOR SENDING THESE, DR. STEPHANIE READERS! Yay! Another person who dislikes the Elf on the Shelf!! I hate lying to children just to get them to obey. I love the magic of age 4, but kids live in a world of magic without me making things up. I don’t even use Santa. I mean, I’ll read books about Santa, but when asked I tell my children that some books are “true” and some are “fun” and that this is a “fun book”. (Note: I do not run around the house yelling “THERE IS NO SANTA” – I just don’t go around saying “Eat your veggies or Santa won’t bring you anything” nor do I say any of the gifts come from Santa). Sidenote: When we say Santa brings gifts to kids that are good, then that means that if a poor family can’t give as many gifts they most be “bad” and deserve less. Once they’re in elementary school they’ll be sharing what they got from “santa” and economic desparity = bad behaviour seems like a poor lesson to me. I know this thread is a year old, but it is still relevant as the Christmas season is upon us once again. I agree 100% Karyn! Children live in a magical world without adults having to lie to them about everything, why do adults forget this? Elf on the Shelf seems to be for the most part, another set of lies parents use as a tool to get their kids to behave for a month. Then what happens after that? In my house we don’t lie about Santa either. I can tell you that there is just as much holiday magic in my household without all of the lies… I am not trying to offend anyone, and apologize if some of you take it the wrong way..
You bring up such good points, Karyn. I hadn’t even thought of the economic issues Santa brings up. Thanks for your comments. Hope you have a wonderful (and elf-less) holiday!! I hadn’t come across this Elf phenomenon. Perhaps it didn’t make it to (my part of) Australia. But it does sound rather creepy. I’m particularly pleased, though, to see you raise the issue of Santa more generally and lying to our kids. As a psychologist myself I wonder if there may not be consequences in the difficult teen years of such “harmless lies” told in the early childhood years – when peers are saying how good something is (drinking, smoking) that parents have rightly cautioned about the dangers of – but that doesn’t have immediate negative effects to confirm the truth of the parents’ claims. Karyn’s point on Santa and perceptions of poverty is also well-made. Thanks for reading and thanks for your comments! I agree that it is rather unusual that we make such a habit of lying to our kids around the holidays.